I am quite sure that anyone who has had gourmet coffee would have tried The Coffee Bean & Tea Leaf at least once in their life. Starbucks, Gloria Jeans, and Peet’s are also other names that have become household mentions .While the kind of coffee served there might not necessarily be all that great, many people do hang out at their cafes for the simple fact that it is all nicely done up, and is the perfect place to relax and catch up with your family and friends. Most of these venues also come with their own charging points and free Wi-Fi, as some executives do go to such places to do their work. Well, The Coffee Bean & Tea Leaf rebrand and refresh their premises with ZON and its premier product – the Powersol. Needless to say, the rebranding effort will see new logos, cups, as well as interior design and innovations introduced to the masses. ZON intends to make sure that the innovation effort of The Coffee Bean & Tea Leaf will be quite unlike anything that has been seen before, especially when it comes to other coffee retailers. 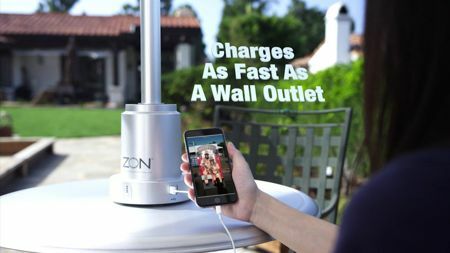 The ZON Powersol will be a feature in future venues, where it functions as a solar battery hub that will be able to charge mobile devices as fast as a wall outlet — regardless of whether it is day or night. What makes this all the more interesting is the fact that it is capable of juicing up a trio of mobile devices simultaneously as fast as a regular wall outlet. You will also be able to make use of your mobile devices even as it juices up. ZON’s charging stations will be wholly solar powered, where they will be fitted onto the coffee retailer’s umbrellas. This just goes to show how far solar charging technology has come from its early days, and whether other coffee retailers will follow suit or not remains to be seen. The Liftware Steady Starter Kit – tremor be gone!